The advent of 5G will have a tremendous impact on wearables makers Fitbit (NYSE:FIT) and Garmin (NASDAQ:GRMN), as well as FIT stock and GRMN stock. By enabling wearables to do so much more, and making them so much more indispensable, 5G will make wearables much more popular and valuable, boosting these companies’ financials. As a result, FIT and GRMN should both be considered 5G stocks. In the very near future, 5G will enable activity trackers, working together with other devices, to track movements of multiple parts of our bodies, Ian Hughes, an Internet of Things analyst at 451 Research, told Wareable. Hughes used the example of tracking the punches of boxing students. But trainers, human or robotic, could also use 5G technology in conjunction with wearables to monitor the forms and techniques of runners, swimmers, golfers, weightlifters, or just about any athlete. The advent of 5G will also enable wearables to more precisely monitor the physical, emotional, and mental well-being of individuals, Bloomberg reported recently. That will enable some obvious real-time applications, like monitoring people who are at high risk of every illness from schizophrenia to heart attacks to sleep apnea to strokes. But some less obvious uses, such as monitoring of employees by employers, could also proliferate. As 5G enables wearables to more effectively monitor people’s health and well-being, FIT stock and GRMN stock should rise. That’s another reason why they should be considered 5G stocks. Also, 5G looks poised to finally bring about a long-talked-about-but-little-realized application: location-based marketing. 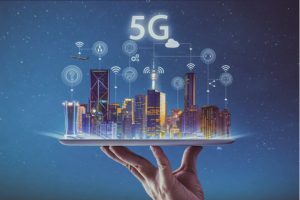 Because of the way that 5G technology works, devices that use 5G will broadcast “which building you are in,” Fast Company reported. Consequently, marketers who obtain access to mobile data, by paying telecom companies, will be able to determine where consumers are at the moment and the stores and areas they tend to visit. Using 5G technology, marketers will be able to send captivating, location-based ads to consumers’ smartwatches. Of course, marketers will probably have to pay Fitbit and Garmin for the privilege of doing that, providing a boost to Fitbit stock and Garmin stock. That yet another reason to view FIT stock and GRMN stock as 5G stocks. Wearables connected with 5G could automatically sense where their wearers are and use that information to give instructions to other devices. For example, a smartwatch could be programmed to start a connected coffee maker as soon as its owner gets out of bed in the morning. 5G-enabled wearables could also inform self-driving cars when their owners are in front of vehicles or when they are about to cross the street. Furthermore, 5G will enable smartwatches to deliver text messages and voice services while still having the long battery lives of Fitbit’s devices. The arrival of 4K video, AR and VR means that a huge amount more video is inevitable. So if there’s a single wearable device that is destined for a brighter future because of 5G, it’s got to be the head-up display (HUD), which is set to be revolutionized by augmented reality. AR,VR, and 4K video, of course, can be used for many functions, from virtually trying on clothes to greatly enhancing video games to more easily recording great events. Since Fitbit and Garmin have a tremendous head start in the wearables market, and already have well-established brand names, they may be able to become leading sellers of headsets that enable VR,AR, and 4K video, making them even more attractive 5G stocks. FIT and GRMN should both be considered 5G stocks because the proliferation of %G will make smartwatches so much more useful and valuable. Both FIT stock and GRMN stock can be further boosted by 5G if they user their strong brand names to enter the headset market. As of this writing, the author owned shares of Fitbit stock. Article printed from InvestorPlace Media, https://investorplace.com/2019/04/fitbit-garmin-solid-play-5g-stocks/.